Winter always seems so much more romantic than summer. foggy, atmospheric days, warm fires at home and multiple layers of clothing. Looking at the latest winter clothes makes me think about snowy european winters, living in a cottage near a forest in Scandinavia. Fur hats coats and gloves, velvet shoes and snowflake patterned sweaters. 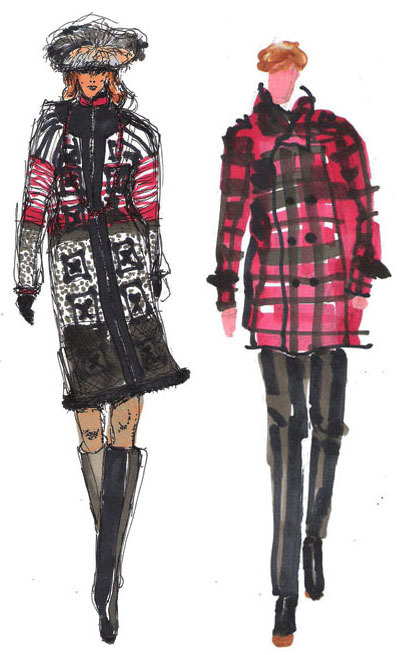 Plus I love drawing people in bulky, ornate winter gear rather than exposed summer clothes. I hope my next european adventure involves a big tartan coat like the one i sketched above and a log cabin on the edge of a wild forest.